Since 1943, St. Paul’s Lutheran Church has been a significant, if perhaps somewhat hidden, oasis of faith and fellowship for the people of Wethersfield and its surrounding communities. When asked why people have sought us out, the response nearly always has something to do with our hospitality. We are a community of faith where all people are welcome—no matter what. We are an oasis of mutual support, love and hope in a world that can be rather bleak and brutal at times. In John’s Gospel, Jesus told his disciples, “By this everyone will know that you are my disciples, if you have love for one another.” (John 13:35) I believe that the kind of love that we are called to at St. Paul’s is the love that Jesus’ disciples had for one each other. And this kind of love is not the same as that which the world values. In the world we can love someone who makes us feel good or who gives us something of value in return. In the world we can love things as much as people. But the love to which our Lord has called us goes far beyond the love of objects that have value or people who are attractive to us. The love to which our Lord has called us is a love that is extended to friends and enemies alike. And it takes a love as strong as this to begin to bring healing to a world like ours that is so divided by cultural, racial, economic, social or other differences. If you are interested in exploring what this kind of love can be like, come visit us. When, in John’s Gospel Nathaniel asked Philip if anything good could possibly come from Nazareth, Philip responded, “Come and see.” (John 1:46) We extend this same invitation to you. Come and see what our Lord is doing in Wethersfield. Come and experience the hospitality and love that gives shape to our community of faith. Come as you are and see what our Lord can do in your life, too. The story of St. Paul’s Church begins on Sunday, October 18, 1942 when a mission congregation of 33 people gathered in a vacant store at 689 Wolcott Hill Road to worship. The monthly rent was $50. Saint Paul’s Evangelical Lutheran Church was officially organized on March 21, 1943 with an original charter membership of 76 persons. The store soon proved too small for this growing congregation. 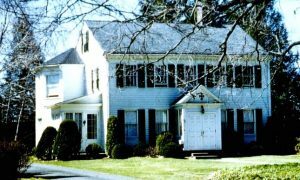 Three months later, on June 20, the congregation voted to purchase the Griswold property at 371 Wolcott Hill Road. For fifteen years the congregation worshiped in a chapel on the first floor of that white house that served also as the home of its first pastors. Eventually, this chapel, too, proved too small and a new facility was built. On New Years Day, 1958, the congregation began worshiping in its new church building, and has done so ever since. As the congregation grew, it became necessary to build a parish education building, which it did in 1968. And most recently (on May 19, 1996) it dedicated the newly completed Fellowship Hall that connected the Church Sanctuary to the Education Building. The history of Saint Paul’s Church, however, is more than a story about the construction of new buildings. It is first a story of extraordinary faith and an even more extraordinary love. And it is a story that is still being written. What unites the lives of each person who worships here is a belief that in and through the life, death and resurrection of Jesus of Nazareth, God was and continues to be actively forgiving, renewing, and recreating the world. Thus the story of Saint Paul’s Church is about that love taking root in the faith-filled lives of its people. And the place where that love is first encountered is in worship. At the heart of the life of this congregation are the Word of God and the Sacraments of Baptism and Communion. It is through the Word and Sacraments that we are challenged by our Lord’s “new commandment” to love others as he loved us and we encounter the new life and the endless hope and possibilities that are ours through Christ. Worship defines who we are as individuals, and who we are together. It gives us the hope and strength necessary to not only survive the challenges that life can bring, but to thrive even in the face of adversity. Worship also defines the kinds of ministries and programs that make up the life of this congregation. The story of God’s love takes on substance and brings about real change in countless lives through the voices and hands of the people of this congregation. This unfolding story is found in the ministries of this congregation. Through these ministries God’s people bring the love of God in Jesus to those with need, both within this congregation and to those sisters and brothers who are in our neighborhoods and in the world at large. We are in a new chapter of St. Paul’s story. Is is sure to be full of spiritual renewal and excitement, many new ventures and possibilities, and joyous surprises. It is a chapter waiting to be written by God’s spirit through all of our faithful responses to God’s call. We invite you to be a part of this new venture. Your faith and love can make a world of difference. May God bless us all as together we journey into our future.